The 2018 edition of the VISSLA ISA World Junior Surfing Championship - presented by Visit Huntington Beach – has set the teams participation record for the second year in a row, with the 44 attending nations set to surpass the record 41 set in 2017. At the same time, the 154 girls that have registered for the event has also set a new participation record, set at the 2016 edition in the Azores Islands of Portugal when 104 girls took part. The increase in participation marks a success in the ISA’s push for gender equality in the sport. To see the full team rosters, click here. The record growth is highlighted by the return of Chinese Taipei, Fiji, and Samoa, who will all look to build on their first-time appearances in 2017 at this year’s edition in Huntington Beach, while China will field a junior team for the first time in the event’s history. Headlining the world-class talent to compete are a range of past ISA Junior World Champions, including Hawaii’s Summer Macedo (2015), USA’s Alyssa Spencer (2017) and Japan’s Joh Azuchi (2017). The host team USA will look to continue their streak of dominance on home surf, after taking the Team World Championship Trophy in two of the last three editions of the event (2015, 2017). They will return seven of the twelve surfers from their 2017 Gold Medal squad, adding valuable championship experience to their 2018 campaign. The 2018 edition of the VISSLA ISA Juniors marks an important moment in the event’s history as the first to feature equal slots for girls and boys, once more highlighting the ISA’s global commitment to gender equality. In 2018, all four divisions, Girl’s and Boy’s U-16 and U-18, will feature a maximum of three athletes each per country. Having played a historic role in the history of the ISA, Huntington Beach will return to host its fifth ISA Global Event in 2018. 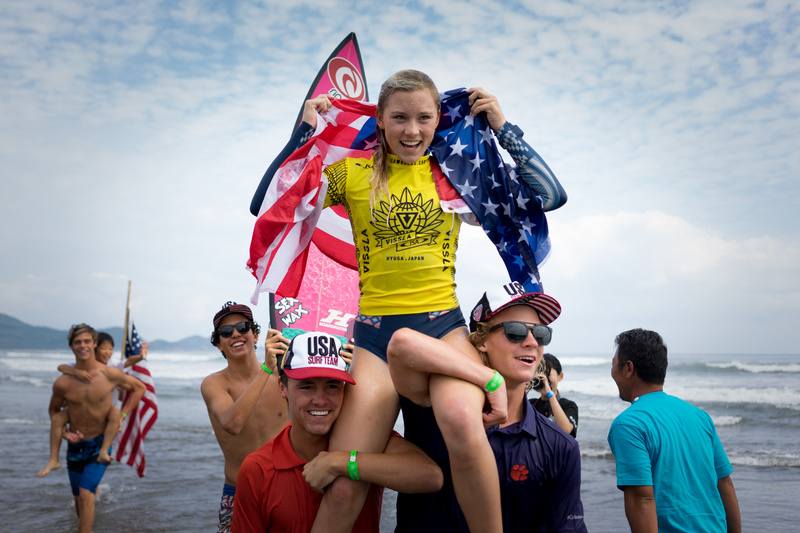 The last time the ISA Juniors were held in Huntington Beach was in 2005 when Australia’s Stephanie Gilmore earned her second ISA Junior Title. Since the inception of the Junior Division in the ISA in 1980, the event has been a glimpse into who will become the future stars of the sport. Legendary surfer Tom Curren jump-started his career as the first ISA Junior Champion. Past and current stars followed in his footsteps, including Gabriel Medina, Julian Wilson, Jordy Smith, Filipe Toledo, Owen Wright, Leonardo Fioravanti, Stephanie Gilmore, Sally Fitzgibbons, Laura Enever, Tatiana Weston-Webb, and Tyler Wright. “2018 is set to be another incredible year for the VISSLA ISA World Junior Surfing Championship. We have an elite level of talent coming from all around the world, demonstrating the inclusive, global nature of the ISA. “This is a year for the girls to shine, as the first edition to feature complete gender equality. The level of women’s Surfing has been exploding and I am excited to see who will rise to the top and stake their claim as World Champions. “I would like to give special recognition to the dedicated support of Vissla towards the ISA and Junior Surfing as a whole. They have been a key factor in the growth and success of this Global Event since 2014, and I look forward to growing our partnership through 2020 and beyond. The event will be streamed live on www.isasurf.org October 27 – November 4.